The Elizabeth Evarts de Rham hospice home, located on a quiet street in Cambridge’s Huron Village neighborhood, was the first hospice residence to open in Massachusetts. On the outside, the seemingly typical two-family home is free from signage and welcomes visitors like any other home in the diverse, eclectic Cambridge neighborhood. However inside the home, our staff and volunteers foster a warm, supportive, patient-centered environment. Nurses are on-site around the clock to provide comprehensive hospice care. Our de Rham home features an elevator, two living rooms, and a common dining room. A private wooden deck overlooking our lush green garden provides a tranquil space for loved ones to gather. Our bird feeder welcomes sparrows, blue jays, cardinals and more. Each of the five private bedrooms is fully furnished, complete with its own bathroom. 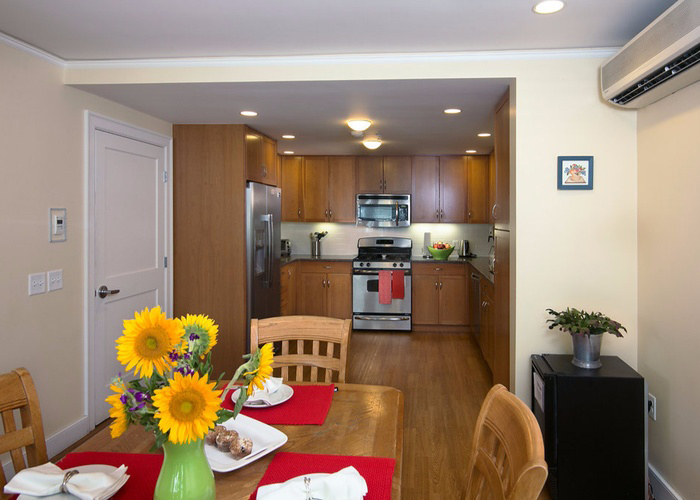 Amenities include an electric hospital bed, cable television, WIFI internet, telephone and a closet storage system. The progressive home is the first LEED certified hospice residence in New England.